By Bruce Cory, editorial advisor and Nicole Mader, data analyst at the Center for New York City Affairs. 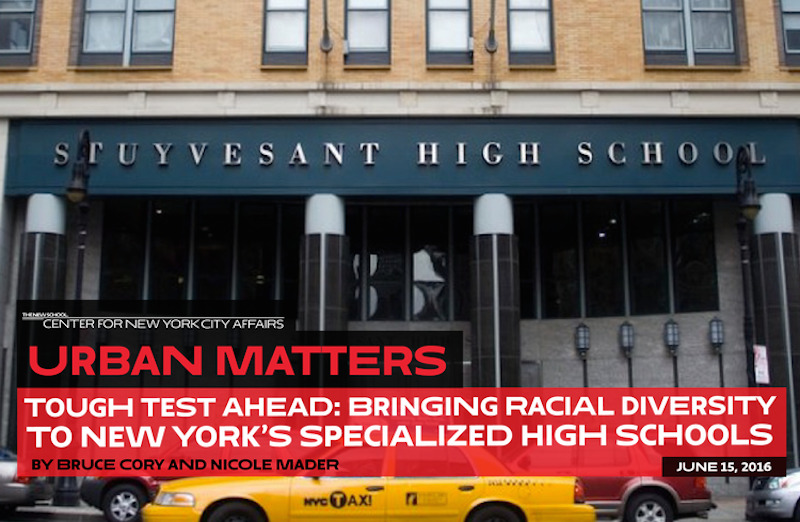 There’s a longstanding debate about why so few Black and Hispanic students are admitted to New York City’s specialized high schools, including Stuyvesant, Bronx Science and Brooklyn Tech. They accounted for fewer than 9 percent of students offered admissions at eight specialized schools for the current school year; that’s down from 9.6 percent the year before. Some say the specialized high school admissions test (SHSAT) is discriminatory and should be scrapped; others say the test merely reflects the poor preparation most Black and Hispanic students, who make up some 68 percent of public school enrollment, get in the elementary and middle schools. We found, for example, that almost 55 percent of Asian 7th-graders who scored Level 4 on either math or ELA tests in the 2012–13 school year are now wrapping up sophomore years at specialized high schools that use the SHSAT for admissions. However, only about 16 percent of such Black or Hispanic 7th-graders are now in one of these specialized schools. That means that as 8th-graders, these approximately 1,710 bright Black and Hispanic students either: passed the SHSAT in October 2013 but then declined offers from specialized high schools; didn't score high enough for admission; or didn’t even take it. Our analysis shows that most have now gone on to non-specialized public high schools also attended by high-performing White and Asian students. But more than 300, or about 21 percent, have not. They instead are scattered among some 142 high schools that high-performing White and Asian students don’t attend at all. It’s also easy to identify middle schools where more Black and Hispanic students could benefit from intensive SHSAT help. In 2012–13, for example, the top five middle school “feeders” to the specialized high schools sent 62 percent of their high-performing White and Asian 7th-graders to those high schools, but only 24 percent of their similarly high-performing Black and Hispanic students. Looking at the numbers another way, in 2012–13 there were 54 middle schools with 10 or more high-performing Black and Hispanic 7th-graders—a total of exactly 900 kids. Only 129, or 14 percent, of them went on to specialized high schools. Now, some caveats: The Center for New York City Affairs recognizes that even if this admissions diversity improves, at best such progress will likely be measured in dozens, not hundreds, of students. We also strongly believe this is far from the only pressing educational challenge New Yorkers face. Our InsideSchools and education research projects have long worked to improve the full spectrum of elementary, middle and high schools. The InsideSchools staff regularly reminds high school–bound students and their parents that there are plenty of good options outside the specialized schools galaxy. Like others, we’ve also heard the criticisms that some of the specialized schools suffer from an unhealthy, hyper-competitive and grades-obsessed student culture.